Freaky Aces Casino, operated by HighWeb Ventures N.V., promises to serve bettors like you the best in the iGaming industry. It started running in 2017 and currently holds a Curacao license. If you wish to play on the go, you can do so as the site is mobile device compatible. The gaming hub even has its own mobile app you can download for Android and iOS. However, before you register, do know that the casino has a list of restricted countries which includes the United Kingdom, Singapore, Portugal, and Ukraine. This means that if you live in any of these jurisdictions, you cannot sign up with the gaming hub. You can also double check with the site’s customer support by contacting them through email or live chat. With these said, what else are Freaky Aces Casino’s features that set it apart from other sites? Find out by reading this in-depth casino review. 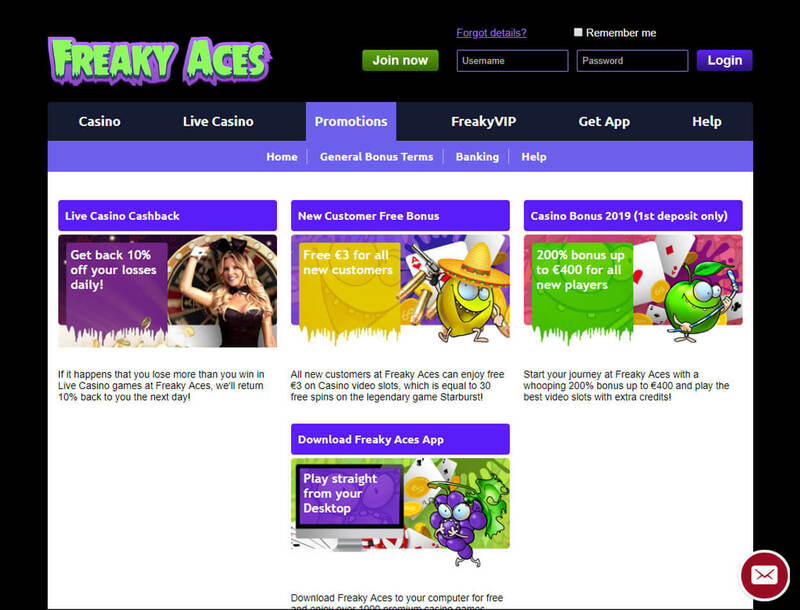 You can expect Freaky Aces Casino to offer you multiple promos such as welcome deals and a cashback. Moreover, it even has its own VIP program you are instantly a part of. Check these casino bonuses below. You are instantly eligible for a no deposit deal once you sign up with the gaming hub. This bonus rewards you €3 worth of free spins. All in all, the promo is equivalent to 30 free spins on the well-known NetEnt title called Starburst. Before you can cash out your winnings, though, you must first complete the 80-time wagering requirement. Another welcome promo that the betting portal offers you is its 200% first deposit bonus up to €400. You can use the reward on the site’s slot games only. This deal comes with a wagering requirement of 35 times the amount deposited. You can receive a daily 10% cashback from your losses on the Live Casino section of the site. To be eligible for this bonus, you must first have a loss of at least €10 on any Live Casino title. Also, do know that this rebate does not have any limits for as long as you meet the minimum loss amount. Freaky Aces Casino has its own VIP program called FreakyVIP. You are immediately part of this program as soon as you sign up with the gaming hub. The program has five different rankings: New Customer, Bronze, Silver, Gold, and Ruby. The highest level you can reach is Ruby. You will be getting more perks while playing on the site if you have a higher level. These special perks are invitations to VIP events, your own VIP manager, and special promos. These are all of the promos that you will find on Freaky Aces Casino. However, if you are looking for tournaments, the gaming hub offers seasonal competitions. The catch is that you must be at least a Silver-ranked player to be eligible to join these tourneys. The betting hub offers you a wide variety of games that you can choose from. 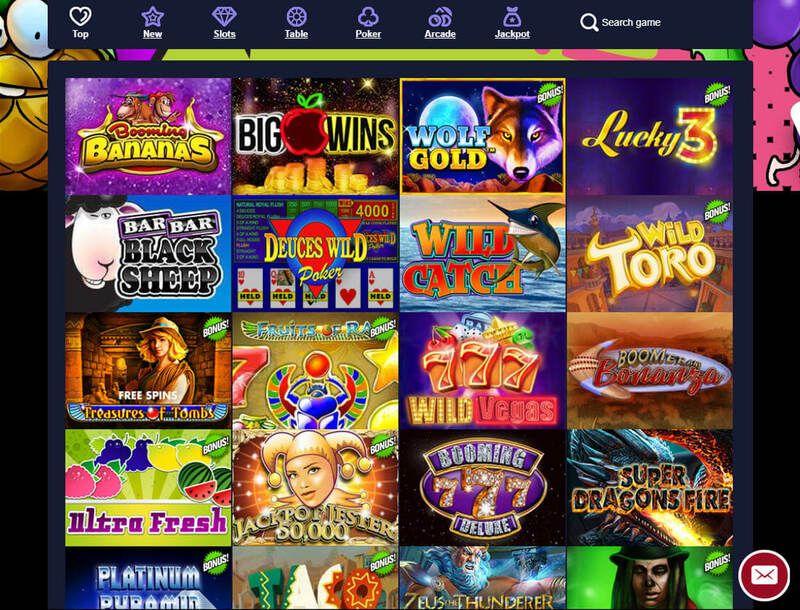 You will find slots, table games, and live casino titles that are made by reputable software developers: Pragmatic Play, NextGen Gaming, and Elk Studios, among others. You will find titles like Feng Shui Kitties, Foxin’ Wins, and Chilli Chilli Bang Bang on the casino’s Slots section. Meanwhile, table games like craps, roulette, baccarat, and poker are available on the gaming hub. Live casino titles for roulette, money wheel, blackjack, and poker, among others, are available on the site as well. Freaky Aces Casino accepts any of the following fiat currencies: EUR, USD, GBP, SEK, NOK, DKK, AUD, NZD, and CAD. If you are a crypto bettor, though, you will not be able to use any of your coins on the site. When topping up your account, you must deposit at least €10 per transaction. On the other hand, withdrawing your winnings require a minimum amount of €25. Before you can cash out, though, you must first complete the gaming hub’s KYC form. Also, you can file only one withdrawal request per week. Freaky Aces Casino lets you experience a great gaming experience with its generous promos, accessible payment channels, and a wide variety of top-notch games. The site even has its own VIP program that can motivate you to keep on playing onsite because of the special perks you will receive while in it. Unfortunately, the betting portal’s lack of crypto support may turn you off if you are a crypto bettor. 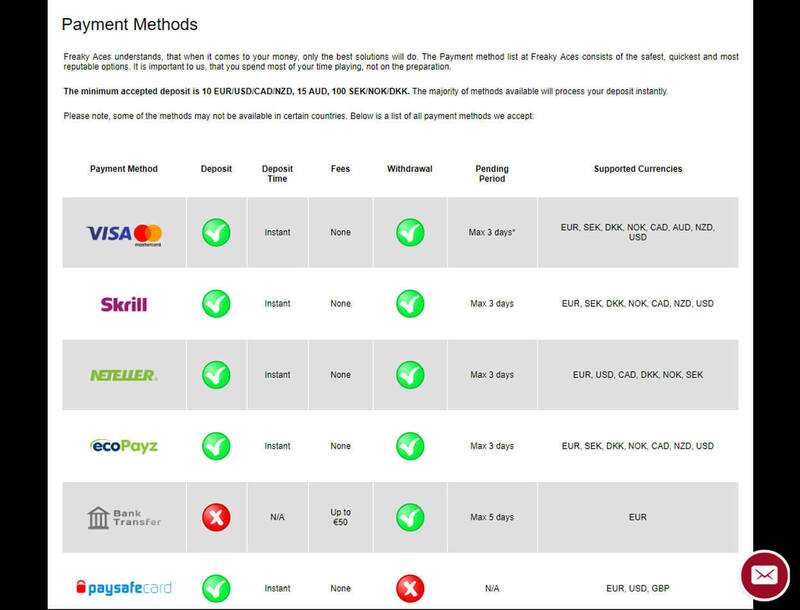 But with the use of some of the available banking methods like Skrill and Neteller, you can convert your coins to the site’s accepted currencies conveniently. 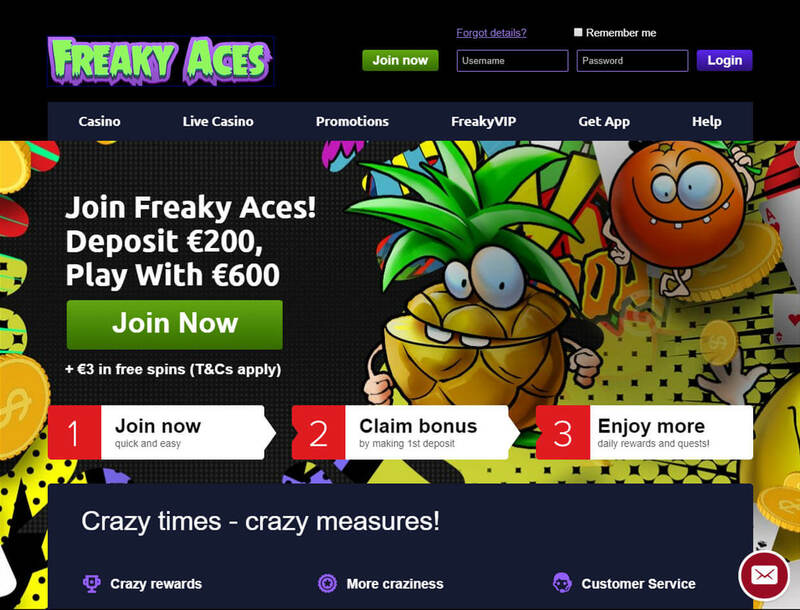 Overall, Freaky Aces Casino is a gaming hub with freakishly amazing offers. You should definitely look into signing up with this online casino.